A collection of three classic crime novels by Agatha Christie, the undisputed Queen of Mystery. In And Then There Were None, the bestselling mystery of all time, ten strangers are lured to an isolated island mansion of the Devon coast where, over dinner, a recorded message accuses each of them of harboring a guilty secret. And then night after night, one by one, another of A collection of three classic crime novels by Agatha Christie, the undisputed Queen of Mystery. In And Then There Were None, the bestselling mystery of all time, ten strangers are lured to an isolated island mansion of the Devon coast where, over dinner, a recorded message accuses each of them of harboring a guilty secret. And then night after night, one by one, another of them is found dead. The Leonides, at the center of Crooked House, are one big happy family living in a sprawling ramshackle mansion. That is until the head of the household, Aristide, is murdered with a fatal barbiturate injection. Suspicions naturally fall on the old man’s young wife, fifty years his junior. But sometimes the best-reasoned suspicions overlook the clues. Endless Night is the story of penniless Michael Rogers, who discovers the beautiful house at Gypsy’s Acre and heiress Ellie, a dream come true. But he ignores an old woman’s warning of an ancient curse, and soon evil begins to stir in paradise—for, as Michael discovers, Gypsy’s Acre is a place where fatal “accidents” happen. 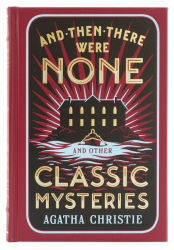 And Then There Were None and Other Classic Mysteries is one of Barnes & Noble's collectible classics editions. Each volume features authoritative texts by the world's greatest authors, in exquisitely designed bonded-leather bindings with distinctive gilt edging and an attractive silk-ribbon bookmark. Decorative, durable, and collectible, these books offer hours of pleasure to readers young and old, and are an indispensable cornerstone for every home library.